Wow! 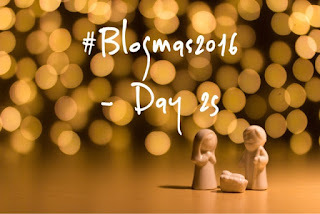 I made it to day 25 of #Blogmas and I'm really proud of this achievement, as I thought I'd struggle to do a post a day, it's quite the commitment. With it being Day 25, that can only mean one thing, (in a Noddy Holder voice) it's Christmas [Day]! As I look back on Christmas 2016, I think it will be with fondness, our son is more conscious of what's going on this year than last year, his pronunciation of 'Anta', reindeer and Santa's 'Ho, Ho' will stick in the mind. Our little boy was lucky enough to see Santa on a number of occasions this year, but the highlight (for me) was visiting the National Trust's Attingham Park estate and going into their winter wonderland to see the big man himself - though it would have been nice if our little man could have raised a smile for a photo! We've had a lot of fun this year already and I'm sure there will be more to follow as we start to hand out gifts later this morning. I hope you all have a fantastic Christmas if you celebrate it and if not enjoy the bank holidays with family.